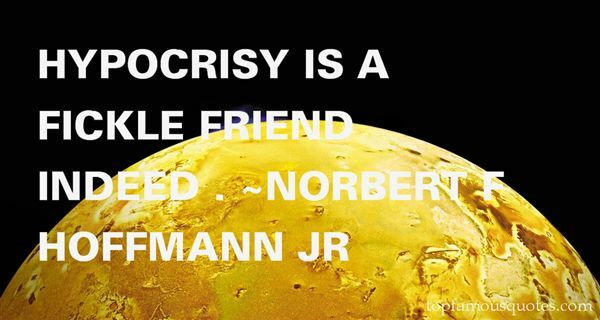 Reading and share top 184 famous quotes and sayings about Hypocrisy by famous authors and people. 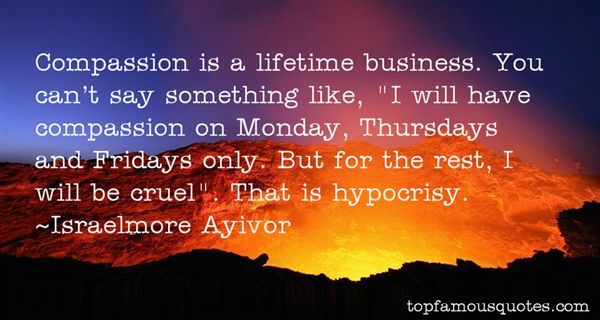 Browse top 184 famous quotes and sayings about Hypocrisy by most favorite authors. 2. "Politeness, n. The most acceptable hypocrisy." 3. "The important task of literature is to free man, not to censor him, and that is why Puritanism was the most destructive and evil force which ever oppressed people and their literature: it created hypocrisy, perversion, fears, sterility." 4. "The lamentable expression: 'But it was only a dream", the increasing use of which - among others in the domain of the cinema - has contributed not a little to encourage such hypocrisy, has for a long while ceased to merit discussion." 5. "Unwell? I was fine, as good as one might feel in such circumstances. No, my friend, I merely pretended to faint. I'm a good actress. Actually, a thought had come into my mind: if a terrorist, I said to myself, were to blow up this church with all of us inside, at least one-tenth of all the hypocrisy in the world would disappear with us. So I had myself escorted out." 6. "On Saturday night, I would see men lusting after half-naked girls dancing at the carnival, and on Sunday morning when I was playing organ for tent-show evangelists at the other end of the carnival lot, I would see these same men sitting in the pews with their wives and children, asking God to forgive them and purge them of carnal desires. And the next Saturday they'd be back at the carnival or some other place of indulgence. I knew then that the Christian church thrives on hypocrisy, and that man's carnal nature will out no matter how much it is purged or scoured by any white-light religion." 7. "As for the third Official Reason: exposing Western Hypocrisy - how much more exposed can they be? Which decent human being on earth harbors any illusions about it? These are people whose histories are spongy with the blood of others. Colonialism, apartheid, slavery, ethnic cleansing, germ warfare, chemical weapons - they virtually invented it all." 8. "Hypocrisy is a quality found in others. I am an optimist. I believe that saying the right thing will eventually cause people to do the right thing for me." 9. "Kids have what I call a built-in hypocrisy antenna that comes up and blocks out what you're saying when you're being a hypocrite." 10. "A Conservative Government is an organized hypocrisy." 11. "No habit or quality is more easily acquired than hypocrisy, nor any thing sooner learned than to deny the sentiments of our hearts and the principle we act from: but the seeds of every passion are innate to us, and nobody comes into the world without them." 12. "Each year, the Great Pumpkin rises out of the pumpkin patch that he thinks is the most sincere. He's gotta pick this one. He's got to. I don't see how a pumpkin patch can be more sincere than this one. You can look around and there's not a sign of hypocrisy. Nothing but sincerity as far as the eye can see." 13. "Armed neutrality makes it much easier to detect hypocrisy." 14. "Culturally, I have always been part of the proletariat. I lived side by side with the sons of glassblowers, fishermen and smugglers. The stories they told were shaper satires about the hypocrisy of authority and the middle classes, the two-facedness of teachers and lawyers and politicians. I was born politicized." 15. 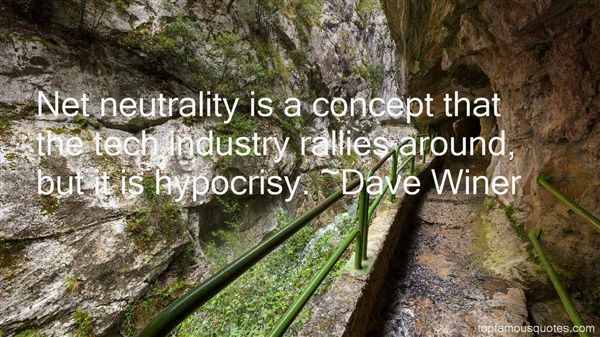 "Net neutrality is a concept that the tech industry rallies around, but it is hypocrisy." 16. "It may be that Christians, notwithstanding corporate worship, common prayer, and all their fellowship in service, may still be left to their loneliness. The final break-through to fellowship does not occur, because, though they have fellowship with one another as believers and as devout people, they do not have fellowship as the undevout, as sinners. The pious fellowship permits no one to be a sinner. So everybody must conceal his sin from himself and from the fellowship. We dare not be sinners. Many Christians are unthinkably horrified when a real sinner is suddenly discovered among the righteous. So we remain alone with our sin, living in lies and hypocrisy. The fact is that we are sinners!" 17. "They lived off each other's hypocrisy, fuelling a worthless market of trash." 18. "Personally, I didn't think there was anything wrong with sadness. Just the opposite – hypocrisy made people happy and truth made them sad." 19. "I believe in life, that it is sweet and that, for all its occasional bitterness, we-man, that is-are headed toward something better - fulfillment. There is much shame, however, and so much hypocrisy around us and these inhibit our fulfillment as human beings." 20. "I find capitalism repugnant. It is filthy, it is gross, it is alienating... because it causes war, hypocrisy and competition." 21. "There may be coarse hypocrites, who consciously affect beliefs and emotions for the sake of gulling the world, but Bulstrode was not one of them. He was simply a man whose desires had been stronger than his theoretic beliefs, and who had gradually explained the gratification of his desires into satisfactory agreement with those beliefs. If this be hypocrisy, it is a process which shows itself occasionally in us all...."
22. "Morality becomes hypocrisy if it means accepting mothers' suffering or dying in connection with unwanted pregnancies and illegal abortions and unwanted children." 23. "Hypocrisy is wretched because the hypocrite says with his tongue what is not in his heart. He wrongs his tongue and oppresses his heart. But if the heart is sound, the condition of the tongue follows suit. We are commanded to be upright in speech, which is a gauge of the heart's state." 24. "Compassion is a lifetime business. You can't say something like, "I will have compassion on Monday, Thursdays and Fridays only. But for the rest, I will be cruel". That is hypocrisy." 25. "Just as Napoleon was the sole authority in the state, so the husband and father was to exercise authority over his family. Unfortunately the only possible result of despotism on either level is hypocrisy." 26. "Feeding the hungry, healing the sick, rebuking hypocrisy, pleading for faith--this was Christ showing us the way of the Father... In His life and especially in His death Christ was declaring, "This is the Father's compassion I am showing you, as well as my own." 27. "Danger. Its name indicates that this is not the straight way but is a way of great variety and many religious philosophies.Hypocrisy,"
28. "When we walk away from global warming, Kyoto, when we are irresponsibly slow in moving toward AIDS in Africa, when we don't advance and live up to our own rhetoric and standards, we set a terrible message of duplicity and hypocrisy." 29. "An epoch which had gilded individual liberty so that if a man had money he was free in law and fact, and if he had not money he was free in law and not in fact. An era which had canonized hypocrisy, so that to seem to be respectable was to be." 30. "Our fear of hypocrisy is forcing us to live in a world where gluttons are fine, so long as they champion gluttony." 31. "Hypocrisy is not generally a social sin, but a virtue." 32. "Reagan and Bush... made the world safe for hypocrisy." 33. "... so many nominal Christians throughout history, took no notice whatsoever of the key parable of Jesus Christ himself, which taught that you shall love your neighbour as you love yourself, and even those that you have despised and hated are your neighbours. This never made any difference to Christians, since the primary epiphenomena of any religion's foundation are the production and flourishment of hypocrisy, megalomania and psychopathy, and the first casualties of a religion's establishment are the intensions of its founders. One can imagine Jesus and Mohammed glumly comparing notes in paradise, scratching their heads and bemoaning their vain expense of effort and suffering, which resulted only in the construction of two monumental whited sepulchres. ..."
34. "Without Christ there is no access to the Father, but futile rambling; no truth, but hypocrisy; no life, but eternal death." 35. "An once of hypocrisy is worth a pound of ambition." 36. "Do not treat others as you would not like to be treated' frees one from hypocrisy. 'Treat others as you would like to be treated' enslaves one with insincerity." 37. "Virtually all political discourse in the days of my youth was devoted to the ferreting out of hypocrisy... Because they were hypocrites, the Victorians were despised in the late twentieth century. Many of the persons who held such opinions were, of course, guilty of the most nefarious conduct themselves, and yet saw no paradox in holding such views because they were not hypocrites themselves-they took no moral stances and lived by none." 38. "Satanism represents opposition to hypocrisy, every human being feels rage, every human being feels anger, and we feel it is natural to express that anger in a healthy way." 39. "Hypocrisy is a fickle friend indeed ." 40. "Because hypocrisy stinks in the nostrils one is likely to rate it as a more powerful agent for destruction than it is." 41. "The key to entering into the Divine Exchange is never our worthiness but always God's graciousness. Any attempt to measure or increase our worthiness will always fall short, or it will force us into the position of denial and pretend, which produces the constant perception of hypocrisy in religious people.To switch to an "economy of grace" is a switch that is very hard for humans to make. We base almost everything in human culture on achievement, performance, accomplishment, an equal exchange value, or some kind of worthiness gauge. I call it meritocracy. Unless one personally experiences a dramatic and personal breaking of the rules of merit (forgiveness or undeserved goodness), it is almost impossible to disbelieve or operate outside of its rigid logic. This cannot happen theoretically or abstractly. It cannot happen "out there" but must be known personally "in here." 42. "She had an evil face, smoothed by hypocrisy; but her manners were excellent." 43. "Go back,go back to sleep.Yes, you are allowed.You who have no Love in your heart,you can go back to sleep.The power of Loveis exclusive to us,you can go back to sleep.I have been burntby the fire of Love.You who have no such yearning in your heart,go back to sleep.The path of Love,has seventy-two folds and countless facets.Your love and religionis all about deceit, control and hypocrisy,go back to sleep.I have torn to pieces my robe of speech,and have let go of the desire to converse.You who are not naked yet,you can go back to sleep." 44. "Art altogether is nothing but a survival skill, we should never lose sight of this fact, it is, time and again, just an attempt -- an attempt that seems touching even to our intellect -- to cope with this world and its revolting aspects, which, as we know, is invariably possible only by resorting to lies and falsehoods, to hyprocrisy and self-deception, Reger said. These pictures are full of lies and falsehoods and full of hypocrisy and self-deception, there is nothing else in them if we disregard their often inspired artistry. All these pictures, moreover, are an expression of man's absolute helplessness in coping with himself and with what surrounds him all his life. That is what all these pictures express, this helplessness which, on the one hand, embarasses the intellect and, on the other hand, bewilders the same intellect and moves it to tears, Reger said." 45. "Life is strange and funny with many winding roads ahead...but the roads of greed and hypocrisy will lead to a person's downfall each and every time." 46. "Your hypocrisy insults my intelligence." 47. "There is considerable hypocrisy in conventionalism. Any thinking person is aware of this paradox; but in dealing with conventional people it is advantageous to treat them as though they were not hypocrites. It isn't a question of faithfulness to your own concepts; it is a matter of compromise so that you can remain an individual without the constant threat of conventional pressures." 48. "Counterfeits of the past, under new names, may easily be mistaken for the future. The past, that ghostly traveler, is liable to forge his papers. We must be wary of the trap. The past has a face which is superstition, and a mask, which is hypocrisy. We must expose the face and tear off the mask." 49. "For God's sake, let's be done with the hypocrisy of claiming "I am a biblical literalist" when everyone is a selective literalist, especially those who swear by the antihomosexual laws in the Book of Leviticus and then feast on barbecued ribs and delight in Monday-night football, for it is toevali, an abomination, not only to eat pork but merely to touch the skin of a dead pig." 50. "If she knew me as I really am she would despise me, and certainly not aid or abet my evil designs. To veil their vices from the sight of the good is the only resource of those who are not blind and know themselves to be vicious.' Thus was I confirmed in habits of hypocrisy; and these, for a time, worked only too effectually to my advantage." She lied to me today," Archie said. "A teenager?" Susan said with faux surprise. "Lying to an authority figure? Impossible."